Kids are masters at pushing buttons, and not listening/ignoring is one button that gets pushed a lot! Kids choose to ignore parents for many reasons. Let's look at a few below and some ways to help turn things around. Power and control. 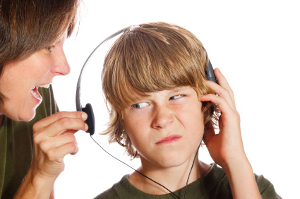 The minute you start arguing with your child over not listening, he has won the battle by getting you upset. It's a vicious cycle, and when that cycle stops, change will happen. To begin, stop arguing with your child. When you notice that you are becoming angry enough to argue, even if the situation is not resolved or your child still isn't listening, stop and put some distance between you and your child. Let him know that you will deal with him later, but for now you need to calm down. At that point go into a different room, make a phone call, pick up a magazine to read...do something to help you cool down. Poor communication. Next, you may need to change the way you are communicating with your child. Remember that you want to teach her how to make good choices. By giving your child choices, you will put the responsibility back on her instead of owning it yourself. For example, let's say that you want your child to pick up clothes on her bedroom floor. You could command that she pick up her clothes by saying, "Pick up your clothes, NOW". But controlling, commanding language only invites conflict. It's better to say, "You need to pick up your clothes some time before dinner tonight. You can go to your friend's house after your clothes are put in your laundry basket." In this way, you are encouraging your child to take responsibility and make the choice of when to pick up her clothes. If she doesn't pick up her clothes, she has the natural consequence of not going to her friend's. In addition, this type of communication is much calmer and does not invite conflict. Just walk away, and let her make the choice. Most important, be consistent. If you say that she can't go to her friend's, don't let her go. And if she gets upset, calmly state, "You didn't pick up your clothes, so you can't go to your friend's. That's a bummer". At that point, the discussion is over...no arguing, no bargaining. Use a reward chart. Depending on the situation, a reward chart may be helpful. If your child is having difficulty listening or completing tasks, a reward chart can reinforce good behavior. For example, if he ignores you when you ask him to brush teeth at night, use a reward chart to mark off when he brushes. If he brushes every day, have a reward set up for him at the end of the week. When using a reward chart, you should work on very specific behaviors and only a few at a time. Don't overwhelm your child by listing too many behaviors at once. Examine your lifestyle. Are you spending enough positive time with your child? Sometimes kids ignore, act out and argue to get attention. Negative attention from a parent can be better than no attention. Between work, school activities, and family responsibilities, parents may forget to simply spend time with their kids. Make time to go for a walk, build a snowman, see a movie, or read together. If you feel like you are not spending enough time with your child, change your lifestyle a bit and make time for her. Sometimes, negative behavior changes when parents and kids reconnect and spend quality time together. Most important, give your child positive reinforcement. Many parents forget this step. People like to hear positive feedback. We all do. Positive feedback is a reward in itself. You may have to work hard on this one if you are in a negative cycle with your child at the moment. But any time you catch her listening or doing something positive, let her know. Check out our "75 Ways To Say Good Job". If you acknowledge your child's positive behavior, she will want that reward again and be motivated to do another positive act to please you!